For obese patients not fit for bariatric (weight reducing) surgery or those that want a non-invasive procedure, endoscopic intragastric balloon placement has been an option. This process has been found to be safe, reversible, and associated with fewer side effects and complications. Many devices are available for intragastric balloon placement. One of such device is ReShape Duo Balloon. ReShape Duo also is known as “ReShape Integrated Dual Balloon System” is one of the intragastric medical devices available for the endoscopic treatment of obesity. It was approved by the FDA on July 28, 2015 (“ReShape Integrated Dual Balloon System – P140012,” 2015). As the name implies, the device is made of 2 balloons that are connected by a silicone shaft. The balloons are filled and sealed separately. The advantage of the two balloon system is that if one ruptures, the other one keeps it in place and prevents it from migrating down the bowel causing obstruction. The indications and contraindications for ReShape Duo balloon are for the gastric balloon in general. It is inserted into the stomach endoscopically under mild sedation. Once in place, the two balloons are then inflated with about 900 ml of normal saline (salt water) mixed with methylene blue dye. The 900 ml of normal saline is equally distributed between the two balloons. The purpose of the methylene blue is to color the urine blue or green in case any of the balloon ruptures. 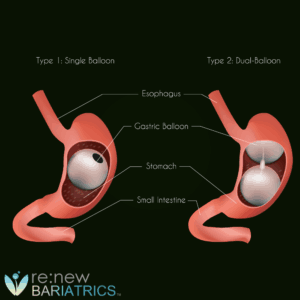 Renew Bariatrics doesn’t offer the ReShape Duo, only the Orbera, and the Spatz gastric balloon systems. Discuss your options with our patient educators today. The mechanism of action of this device is similar to that of other intragastric balloon devices. It occupies space in the stomach leaving the only small amount of space for food. This induces early satiety, with subsequent reduction in food intake and the ultimate goal of weight reduction. Another proposed mechanism of action is by delaying gastric emptying. The duration of stay is six months following which endoscopy removes the balloon after aspirating the fluid. Intragastric devices do not work in isolation. There is need to strictly follow the dietary plan as prescribed by your doctor/nutritionist and to engage in appropriate physical activities if optimal weight reduction is to be achieved. Some degree of discomfort may be experienced following the placement of the balloon, and some patients may experience nausea and vomiting within the first week of placement. Aggressive fluid intake may also aggravate these symptoms. You will be placed on a liquid diet for few days following the procedure, with a gradual transition from liquid to semi-solid to solid foods. The average weight loss following ReShape Duo double balloon system placement is about 16.6kg with percentage excess weight loss (EWL) of 31.8% both at 6months post implantation and 64% of the reduced body weight was maintained at 12 months post-implantation (6 mo after removal) (Kim, Chun, Choi, Kim, Keum & Jeen, 2016). ReShape Integrated Dual Balloon System is an efficient and safe endoscopic treatment of obesity with a significant weight reduction and minimal side effects. Contact Renew Bariatrics to learn more about your bariatric surgery options.